We finally get to see Katie Cassidy’s premiere as Black Siren on last night’s episode of Flash, and she totally stole the show in my opinion. It’s the penultimate episode, and things are really getting heated. Let’s talk about it, spoilers ahoy! Central city is on fire. Metas are fighting cops in the streets, and it is all out chaos. That is, until the Flash rounds them all up. At Star Labs, the team welcomes back Caitlin, who is very shaken up. She warns them that Zoom is going to overrun him, but Barry reassures her. He tells her about his adventures in the Speed Force. As he escorts her away, the team discusses Barry’s overconfidence following his adventures in the Speed Force. Cisco goes to talk to Barry, but before he can even bring it up, he gets a Vibe. He sees a dead bird. Meanwhile, The Canary Cry shakes Mercury Labs, and forces them all to evacuate. Flash gets the memo and heads over helping to evacuate the building as it is collapsing. Black Siren walks away without Flash finding her. Doctor McGee thanks Barry by name, and he brings her back to Star labs to help investigate what happened at Mercury Labs. McGee tells them all that she has no idea who attacked the lab, or why, but that they have backups of the security tapes that would have been recording right up until the building collapsed. 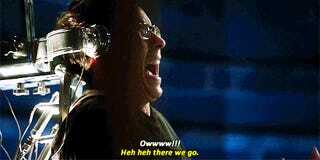 Then she mentions that a few months ago they had an unexpected guest, Harrison Wells. She asks if there’s anyway that he is alive and possibly involved. Harrison himself walks in and said he isn’t. Wally West doesn’t need to have super powers to be a hero. He attempts to stop a purse snatcher on his own. When it turns out that the purse snatcher was a meta though, it goes a little sideways. Thankfully pops is right behind him with a meta collar. The uniforms take them away leaving Joe to try and talk Wally out of trying to go up against the Metas. Wally doesn’t want to sit back and do nothing though. He knows that the Flash can’t be everywhere, and he wants to prove that he was worth saving. When Joe tries to comfort him, Wally unleashes everything he’s felt guilt about, and it becomes clear he isn’t stopping anytime soon. At Star Labs, Jesse asked Caitlin to run some tests on her following the dark matter blast. When Wells arrives, he questions her motives for doing so. Wells assures her that she isn’t a meta human, but she is a genius who can help fight them. Flash retrieves the backup of the security footage from Mercury Labs and brings it back to the team to go over. Then he says that he’s off to help Joe on the streets. When he refers to this as a ‘piece of cake’ the team exchanges concerned looks. Papa Allen goes to talk to Barry about his over confidence. He asks Barry what he saw in the Speed Force that would give him such confidence. Barry says it’s not necessarily optimism, it’s him just not being afraid anymore. When Papa Allen tries to tell him that he still needs to be careful, Barry finally tells him what he’s been keeping inside this whole time, that he doesn’t really understand what Barry has done up until this point, because he wasn’t there. Before Flash can hit the streets though, they get an alert. CCPD has been hit, and he zips off. Zoom is waiting for him though; he starts by talking about their mother’s murders. Once again, Zoom tries telling Barry that they’re more alike than not. Zoom says that he called him for a reason, and he tests him. The building next door is collapsing, and he knows Barry can’t resist saving everyone. After the building was safe, the team regroups at Star Labs to try to work on a plan to take down the metas and Zoom. Barry says they need to think of a way to take them all down at once, and turns to Cisco and asks about the way that he can manipulate frequencies. Cisco and Wells then start brainstorming a type of vibrational tech that can take down metas. As Cisco is leaving, he once again sees dead birds. After the team breaks, Joe pulls Barry aside to tell him what is going on with Wally. He even tells him why he’s so motivated. Then he asks if the Flash would be able to talk to him about it, and Barry agrees. Flash finds wally listening in on a police scanner. Flash tells him that this isn’t his fight, and the best thing he can do is to leave it to the police. Wally says it’s his city now to, and it’s up to all of them to protect it. Caitlin has been having Flashes of seeing Zoom around her. She has a moment of paralyzing fear, and Cisco comforts her. He tells her that she just escaped a phycopath and it’s an expected reaction. Caitlin says it’s more than that though, it feels like he took her sanity. The team then gets the alert that there is metahuman activity at 5th and main. Flash heads over there (but not before repeating the address loud enough for Wally to hear it) to find Laurel Lance. Black Siren says that Laurel Lance is dead, on this earth at least. The two circle each other, as Flash tries to size her up. Her Canary Cry is powerful enough to even bring Flash to his knees. There, Caitlin runs some tests and determines that she didn’t do any permanent damage to Barry. Joe is disappointed in that Wally did the opposite of what Barry was supposed to tell him to do. Barry tries to tell Joe that maybe it isn’t bad for him to want to help, as he did after all just save him. Joe says that he got lucky, and doesn’t want to see the day when that luck runs out. Barry says that they’ve got more than luck on their side though and walks away. Iris follows, to be the next to tell him that he’s being overconfident. She tells him that a little fear can be a good thing, because then it makes them think about which risks are worth taking. Black Siren goes to meet with Zoom to tell him about the showdown with Flash. He knows she didn’t win though, despite her being his ‘last lieutenant left standing’. He orders her to go knock down more buildings so that the Flash thinks they’re random and doesn’t realize what he’s up to. When she asks what is he up to, he replies with “no good.” Which no one saw coming, I’m sure. At Star Labs, Cisco is testing out some frequency device on Wells, and seems to be relishing in the fact that it causes him some discomfort. He refers to it as ‘dimensional shock therapy’ and it should work on anyone from Earth-2. The idea is that Flash runs in a fast circle around the city, the device sends out the waves and bounces around, and it will disrupt the nervous system of every meta in the city. Don’t worry about Wells and Jesse though, because Beats by Wells (patent pending) will protect them. That’s when they get the alert that Black Siren is taking down a building in a residential area, which means hundreds of lives are in danger. That means they have to choose between launching the device and taking down Black Siren. 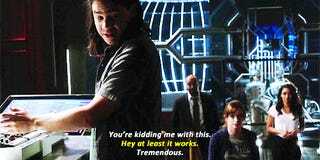 That’s when Cisco get “the worst idea ever” and him and Caitlin, as Reverb and Killer Frost, go to meet Black Siren. They seemingly convince her of who they are, and then question why she is taking orders from Zoom in the first place, given how powerful she is. She asks them what exactly they are planning, and Cisco claims that they want to ambush Zoom, and the three of them together should be enough to take him on. Black Siren gets suspicious though, and tosses something at Cisco, and when he catches it in his right hand she knows that they’re doppelgangers. 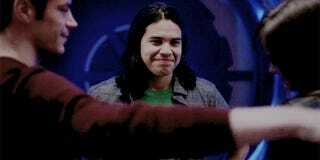 As she is chasing him, Cisco figures out that he can do more with his powers, but doesn’t quite have control of it yet. The rest of the team preps the device, and Flash heads out. Once he’s made the loop around the city, Wells turns on the device. Metas start dropping like flies all across the city, including Black Siren. Zoom, however, was able to open a breach and step through it before it could knock him out. When Jesse’s headphones start malfunctioning, Wells gives her his. Once he passes out they know it worked and tell Flash to bring them all in. Flash rounds them all up and locks them in special cells in the pipeline. 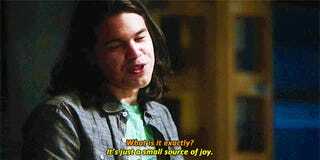 Cisco congratulates Caitlin on playing a convincing Killer Frost, and they all ask how she’s doing. She say that being out there helping people again has helped her feel normal again. At the station, Joe fills the captain in on Flash’s efforts of rounding up the Metas. He asks if they’re all in Iron Heights, and Joe says that some are and some are somewhere else. When the captain asks if he wants to know, Joe says no. Flash then shows up to let him know that despite his best efforts, Zoom was able to escape. Barry then talks to Joe about Wally, and says that he’s too much like his father. He says that he isn’t going to stop him from being the hero that he is going to become. Joe rolls his eyes and says he can’t wait until Barry has kids and they torture him. Barry and Henry arrive at the West house to find a surprise party awaiting them. Romance is in the air for Tina and Henry, and also for Iris and Barry as they both are finally in a place where he feels happy enough to ask her to give them a shot. Wally has a good moment with his father when Joe says that he was proud of him for saving the Flash. If that was feeling too uplifting, we quickly get gut-punched to make up for it. Cisco gets a vibe of Earth two crumbling, torn in half. As soon as he tells the others Zoom himself arrives and takes Henry, taunting the Flash. He brings Henry to Barry’s childhood home to prove that they are alike, and this time Barry will watch his parent die. Henry says that no matter what happens, he’s proud of him. Then Zoom stabs him through the heart. Only in the Blackest of Nights, eh? That sounds familiar. They had an excuse to bring Old Flash and Old (and still) Tina McGee together! And flirting, no less. Mach 50 isn’t a really a thing? Really? The Voyage 1 is the fastest man made object currently, and it goes faster than Mach 50. C’mon Barry you’re supposed to be a science geek! (Mach 50 is 38,363.5 mph, Voyager 1 travels at 38,610 mph). I’m not saying that he can go that fast now, but comic book Flash was faster than the speed of light, which is waaaay faster than Mach 50. Barry says mixing doppelgangers and their families don’t mix when asked if he should tell Sara and Lance about earth-2 Laurel. He finally gets it! Wally was the only one at that table who didn’t know Barry was the Flash, and that must have been a shock for him. NEXT WEEK IS THE FINALE!